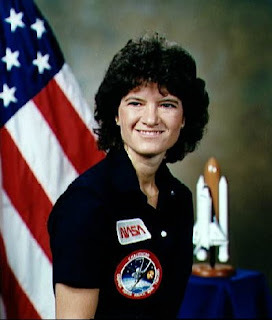 This is Dr. Sally Ride. She is an astrophysicist, and has worked in the space program and science and engineering education for over 30 years. Her accomplishments and awards have spanned those years, and reflect the diversity of her accomplishments. For me, though, I can never think of her without seeing the Time Magazine cover with her on the front. Ride, Sally Ride! read the headline, overlaid on her official NASA photo. Dr. Ride was to be the first American woman in space. After joining NASA in 1977, Dr. Ride was a member of the 1983 Challenger mission STS-7. They lifted off on June 17, 1983. I had just graduated from High School, was shy of my 18th birthday, and had already enlisted in the U.S. Navy under the Delayed Entry Program. Seeing Dr. Ride's photo on that magazine, and reading about her accomplishment, gave me a sense of what was possible. Dr. Ride doesn't see her accomplishment in the same way I do. She adamantly shunned the honor of being the first American woman in space, insisting she had not entered the space program "to become a historic figure or a symbol of progress for women." Perhaps not. But her quiet competence gave young women and girls a glimpse of the future, and her continuing work in the area of girls' education has helped to ensure her legacy won't be wasted. Dr. Sally Ride. Personal Hero. Ground breaker. All around Smart Chick and ill behaved woman. I've never really considered myself a feminist, just a product of my age and upbringing. When I stop to think about it, what surprises me the most is how unsurprised I am to see a woman in any occupation. There are thousands of female NYPD. I see women as tow-truck drivers. I see women driving the subway trains. I see women on construction sites, and not only playing "flag-person". These are all things that would have made people stop and stare until not so long ago. Now, I don't even notice. That's rather strange. Because I remember her going into space, and I don't remember thinking it was strange at all. Then again, I was almost 13, and simply assumed women could do whatever they wanted. Perhaps it affected me so strongly because I was at a juncture in my own life where I was embarking on a career that was traditionally a man's field. Well, that's was kinda my point. I didn't particularly think of there being men's fields and women's fields. There were just jobs. Of course, I had a stay-at-home dad for a couple years while my mom worked, and family full of teachers of both genders, and friends whose parents were both professors. So my worldview may have been unusual for my age. While I love all of your entries in this recurring series, Janiece, this one especially warms the cockles of my heart. Carol Elaine, I'm so envious of your place of employment. I know! I get to talk to astrophysicists every freaking day! Including one of my bosses, who named each of his sons for Star Trek characters. Luckily the names that he chose were Christopher and Alexander. Probably on threat of death from his wife. The epitome of cool in my (admittedly) dorky book. Carol Elaine, we'll be dorks together, then. Smart Men make me swoon.